The biggest upset in all of college football this week had to be Old Dominion’s win over AP #13 Virginia Tech. 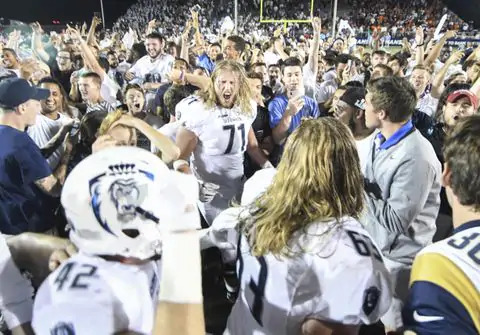 It was an unlikely upset as the Monarchs came in winless at 0-3 coming into this home contest but likely found its starting quarterback of the near future. Old Dominion quarterback Blake LaRussa shredded the Hokies defense, throwing for 495 yards and four touchdowns. Old Dominion had been outscored by a combined 53 points in three loses this season. The Monarchs went 5–7 in 2017, but notched one of the biggest upsets this season. If it was not for Old Dominion, the biggest story may have been Army West Point’s near upset of AP #5. The Black Knights took the Sooners to overtime before Oklahoma prevailed in the extra period 28-21. Two G5 vs. G5 match-ups also went to overtime in San Diego State prevailing over visiting Eastern Michigan and SMU did the same over AAC mate Navy. My last of my Top 5 games was a come-from-behind victory by Cincinnati over Ohio as the Bearcats moved to 4-0 overall. I also added a couple other games as bonus games that involved teams staying undefeated. UCF kept its undefeated mark against in-state out-of conference foe Florida Atlantic. North Texas did the same with a road blowout victory at Liberty. South Florida edged AAC rival East Carolina. And yet another P5 victory for the G5 with Buffalo staying undefeated with its throttling of the Big 10’s Rutgers. Click on the score for a recap of the game and see the highlight video below the score. Why We Should Love NDSU and the Bison?